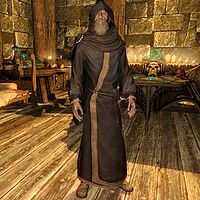 Wuunferth the Unliving is an elderly sorcerer from Windhelm, in the service of Ulfric Stormcloak. He is a common trainer in Destruction and, like all court wizards, sells magic items. Wuunferth plays a big part in the quest Blood on the Ice. He lives on the second floor of the Palace of the Kings and mostly keeps to himself. He wakes up at 4am and then paces around his quarters all day long, at times using the arcane enchanter or the alchemy lab. He is supposed to sleep in his own bed between midnight and 4am, but a bug causes him to go to Sifnar's bed elsewhere in the castle. Wuunferth wears blue mage robes and a pair of boots. He carries an iron dagger and a selection of upper-class items and gold. When you approach him, he will say: "Whatever you've heard I can do is probably true. ", "If Ulfric needs a favor, he has it. Anyone else better pay well for the service. ", "I'd explain my research, but you'd just be confused." and "Yes, I'm a powerful wizard. No, I won't put on a magic show for you." When asked for training he will remark: "Mind what - or who - you practice this on." He will bid you farewell with: "Strength and steel are well and good, but magic is the true power in this world." and "A strong sword-arm wins battle, but a keen mind wins wars." Wuunferth also buys nightshade from town merchant Hillevi Cruel-Sea who will admit: "I also do a little herb growing. The court wizard, Wuunferth, pays us to plant a little Nightshade. Who knows what he uses it for? Hey, could you deliver this bottle of Nightshade Extract to Wuunferth?" When you make the delivery, Wuunferth will take it off your hands with: "Ah yes, the extract, good. Poisonous, of course, but it has its uses. I suppose you want something for your trouble? Here." The quest Blood on the Ice places Wuunferth in a rather awkward position when you find evidence of necromancer rituals inside Hjerim, and a journal, as you present this to both Viola Giordano and Calixto Corrium who will point you towards the court wizard. Viola will remark: "Wuunferth. There have been rumors swirling about him for years. As long as I can remember. But he's a dangerous man. It's why they call him "the Unliving." I wouldn't approach him directly. This information needs to go straight to the steward. He'll listen to you." Calixto will take a look at the strange amulet and further the suspicion about Wuunferth: "Let me see... ah, yes. This is the Wheelstone. It's an heirloom symbol of the power of Windhelm. Traditionally it's carried by the court mage." He will then offer to buy it, although he doesn't think Wuunferth will have any interest in his 'own' amulet: "Wuunferth? Bah. It's purely ceremonial, and he has no use for it. Besides, I wouldn't want to be the one to give it to him. Gives me the creeps. They say he dabbles in necromancy." What you do next is a matter of instinct and how you read the clues. If you choose to follow Viola's advice, speaking to Jorleif will land Wuunferth in jail (see this section). Going directly to Wuunferth and confronting him will solve the mystery much quicker – and save the life of a Windhelm citizen (see this section). Wuunferth: "What is the meaning of this?" Jorleif: "You're under the [sic] arrest, for the Murder of Susanna of Candlehearth Hall. And Friga Shatter-Shield. And all the rest. We're wise to your scheming, you coward." Wuunferth: "Has the whole city lost their brains? I've been scrying and auguring to find the murderer myself." Jorleif: "Make your excuses from the Bloodworks, wizard. Get him out of my sight." Guard: "Yes, sir! I'm sorry, sir. But you'll have to come with me." Wuunferth: "This isn't over, Jorleif!" Wuunferth will then have no choice but to take the long walk to the bloodworks underneath the barracks. The guard will open his cell with: "In you go." and Wuunferth will enter. After a few days, however, your accusations are put to shame as the killer claims yet another victim, this time Arivanya from Windhelm Stables. A guard will be near her body and will say: "I... I thought you captured the Butcher. You said the city was safe, now. How could this have happened?" The guard will then give you an order, starting the quest once again: "Obviously. You should visit the Bloodworks to talk to Wuunferth -- we need to figure out where the evidence went wrong." When you approach Wuunferth in his cell, the wizard can't resist the temptation and will mock you due to the failed investigation: "Oh, isn't that a shame. And here I am in the Bloodworks. Looks like you aren't such a sharp investigator after all." You can choose between two options, both of which net you: "What made you think I was to blame in the first place? I've actually been after the killer myself." If you choose to confront Wuunferth instead of talking to Jorleif, you will not only shorten the quest but also save a life in Windhelm. When you confront Wuunferth with the rumor that he dabbles in necromancy, he will ask: "I beg your pardon? Necromancy? I am a member of the College of Winterhold, in good standing! They haven't allowed necromancy for hundreds of years!" 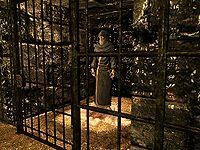 NOTE: From this point forward, Wuunferth's dialogue will be the same as if he were imprisoned. "Looks like you aren't such a sharp investigator after all." Once again, two options. Tell him you found his journals about necromancy and he will say: "Necromancy? I am a member of the College of Winterhold, in good standing! They haven't allowed necromancy for hundreds of years!" If you tell him you found his journal back in Hjerim, he will be surprised: "My what, now? I've never kept a journal, I can assure you. What exactly did this amulet look like?" When you describe it, he will be quick to recognize it: "I know it well. Or at least, I've heard of it. I would wager that carving once depicted a skull. That is the Necromancer's Amulet, of legend. It appears you were at least half-right. There is necromancy at the heart of this." When you tell him that Calixto said it was a Wheelstone, Wuunferth will just remark: "Eehh.. Calixto and his books are often confused about such matters. It happens to the best of us." He will also share an interesting theory on how to catch the real killer: "I've been noting a pattern to when the killings happen. Now that we know they're tied in to some sort of necromantic ritual, I think I know when the next might occur. Let's see. From a Loredas of Last Seed until a Middas of Heartfire... it will happen soon. Very soon. Keep watch in the Stone Quarter tomorrow night. That's almost certainly where the killer will strike next." You will not have any choice but obey orders and head out into the Stone Quarter at night to find the killer and clear Wuunferth's name. When all is said and done, you are to return to Jorleif for your reward. He will let Wuunferth go if you've previously got him arrested: "I'm glad you were able to correct your mistake. I'll release Wuunferth immediately." At the end of the hall, you will see Wuunferth return to his quarters and his quiet life, now a free man. This is the merchandise found in Wuunferth's merchant chest. These items are only available if purchased from the merchant; they cannot be pickpocketed or stolen. They are restocked every two days. Between quest stages 100 and 250, Wuunferth was supposed to have additional dialogue. On the question "Does Ulfric have much need for magic?" he should have said: "No, but then I don't have much need for Ulfric. We both leave well enough alone." On the question "What kind of magic do you study?" he should have said: "Whatever I don't already know. Power is the crux of this world. There's always more of it to be had, if you look in the right places." If you chose to implicate him during Blood on the Ice, Wuunferth will not offer his services until he is freed. 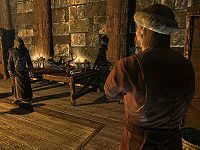 Wuunferth's claim that the College of Winterhold hasn't allowed necromancy for hundreds of years is false; the College has no such policies, although they avoid flaunting the practise in public. Wuunferth was assigned to the wrong bed for his midnight bedtime, specifically Sifnar's bedroll underneath the throne room. Since Sifnar goes to bed two hours prior to Wuunferth, he typically ends up wandering around the throne room all night. Despite being a mage, Wuunferth knows no spells. This page was last modified on 22 June 2018, at 04:59.